Actually, it should be soup in pots , but not so soon as it should have happened. I do not have pots, but have tazhin, but it is not too deep, so liquid evaporated fast, and soup became ragout, though it was tasty as the expected soup. Slice sausages and carrot, dice onion and potato, press garlic, wash lentils and spread all this in tazhin (thick pot or saucepan, as variant), pour there half can of tomatoes, add boiling water till the end, salt it, pepper, bring to a boil and stew over low heat, till lentils become soft. I did this more than hour. Serve with greens. Very nourishing and lazy (pour and let it cook) yummy. 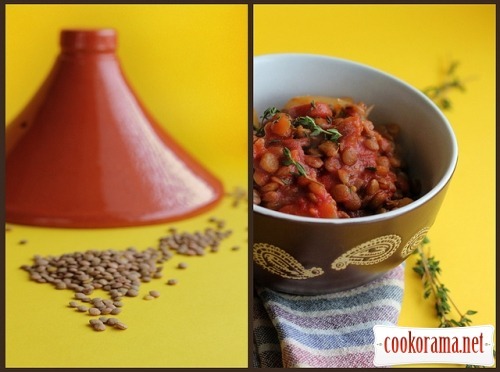 Top of recipe "Ragout of lentils and sausages"